I said, Ask Me Anything… they did. And I answered. 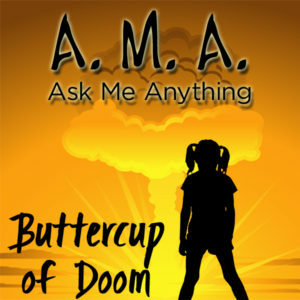 From questions on raising a family to my opinions on extreme horror, from why podcasting to what I really think of The Horror Show with Brian Keene, from blood on the page to vices to con stories… and even the never spoken of political views of a wayward Buttercup. They asked. I answered. You get to listen to it! And remember, this is the edited version. The uncut, unedited, full-disclosure version is available only to my patreons. Become my patreon, support my crazy, get rewards and perks. *note: the Left for Dead blood alluded to is not what you might think, my dad is awesome!